T’was the night before Christmas, I’d just flown to Seattle. I was not prepared for the great Christmas Battle. I walked into my house; the scene was so sad. “Where is Christmas?” I said to my Dad. “It’s Christmas Eve, and we have no tree! Finding a tree was going to be hard. “It’s Christmas Eve!” I said with a start. But I wasn’t so sure, as I looked mile by mile. But there wasn’t a tree left in one single lot. I returned home defeated, annoyed, and angry. And came back home, pine boughs in her arms. And many dead branches were on the dirt floor. “My mother is crazy,” I thought once more. I was doubtful before, but now I was sure. This was no tree! Was my mother blind? She dropped all the branches, saying, “Never fear! They were coming for dinner this Christmas Eve. “You’ve heard of singing for your supper,” she said with glee. One Elder looked stricken, confused and berserk. ‘Til all of the branches were off the floor. But my mother looked pleased as she added red bows. I felt like I was in a Charlie Brown show. The purist in me rebelled at the thought. Your poem was adorable! And what an awesome story, lol. I’m sure that tree is completely unforgettable! 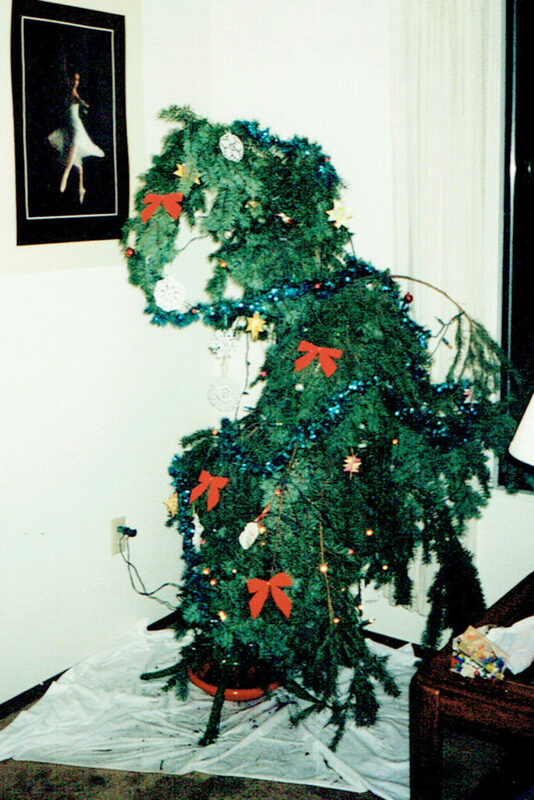 A great telling of the “Grinch” Christmas tree! And I see I was right – you do still remember. Yes, clearly true since I have the picture to prove it! That is the BEST story! I love it! You have such a way with words, too. LOVED IT!